The equipment has been hired by St Paul's Cathedral, Westminster Cathedral and the Royal Albert Hall in London, and by many cathedrals in the UK. 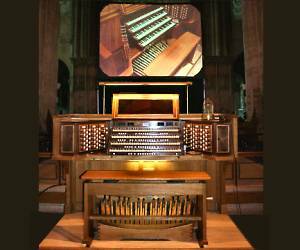 It has also been used at the St Albans International Organ Festival, Warwick International Festival, and the Brussels Inter­national Organ Festival. Cathy Lamb will be performing on the 1878 John Nicholson Organ as part of the current fund raising concerts to restore the organ.